Listen to "638 Canadian Words & 23 Phrases to Sound Smarter: Be More Respected in Canada" on your iOS and Android device. 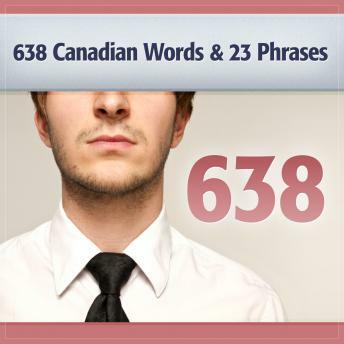 638 Canadian Words & 23 Phrases extends the Sound Smarter and Be More Respected series into Canada. Over 500 of these uniquely Canadian words do not appear in standard Word and Open Office dictionaries. Listening to these words you get a flavor for the brevity and wit of Canadians. In fact, as the author comments, no other variety of English has such a strong sense of humor and wit. The accompanying eBook is very useful for looking up specific words, though the author admits preferring to listen to the words wash over him as he listens on a portable device, in the car, or just at home.